Originally called ‘Captain Marvel’ in early DC comics, due to a convoluted copyright issue Marvel’s distinguished competition were forced to change the superhero’s name to the equally silly moniker, Shazam. The origins of this colourful crime-fighter may be dull, but his cinematic debut is anything but – a warm and entertaining family romp brimming with wit, charm and fun. While Marvel Studios’ films have proved consistent box-office smashes, DC’s rival expanded universe has languished with critical flop after flop. Their films have still turned a tidy profit – mainly due to the marquee value of big-hitters like Batman and Superman – but few would compare the effervescent Avengers to the tubercular spectacle of Justice League. Nevertheless, DC did find some success with Patty Jenkins’ Wonder Woman, and Todd Phillips’ upcoming Joker looks set to be the most interesting and novel comic book film of the year. And so to David F. Sanberg’s Shazam! 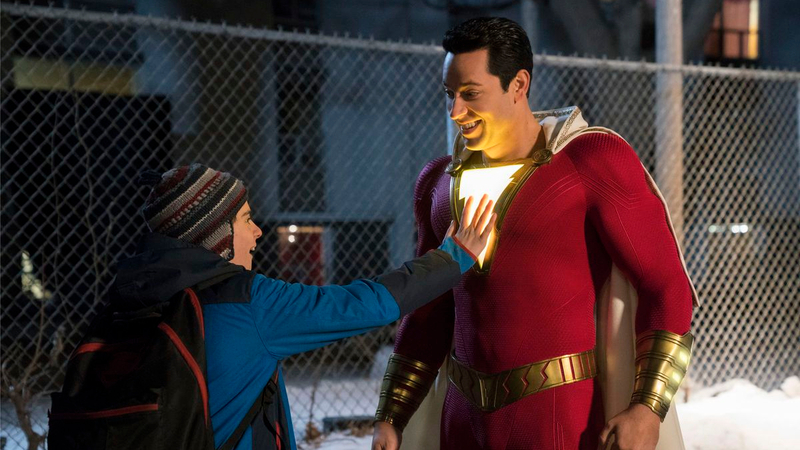 – a sort of American corollary to beloved British comic strip Bananaman – in which the pre-pubescent Billy Batson (Asher Angel) utters a magic word to transform himself into his super-powered adult alter-ego (Zachary Levi). Naturally, there’s a baddie who wants his power for himself – played with typical scenery-chewing relish by Mark Strong – but Dr. Thaddeus Sivana’s machinations are little more than a foil for Levi and co’s light-hearted antics. Despite being set in the same universe as Batman v Superman: Dawn of Justice and the aforementioned Justice League, Shazam! is a world apart from the crushing, edgelord vision of former DC overseer Zack Snyder. Gone is the overprocessed, artificial cinematography in favour of day-glo colours that pop, a sense of humour cribbed affectionately from Big, and a sense of wonder inspired by disposable but awesome 1990s kids fare like The Pagemaster. At its best, Shazam! refuses to take itself seriously, from Angel and Levi’s hilarious and oft-touching chemistry with foster-brother Freddy (Jack Dylan Grazer), to the film’s highlight in which the pair score beer with Billy’s grown up persona, before inadvertently foiling a robbery. Almost inevitably, Shazam! struggles with its villain, who despite being given decent time for his back story, never rises above being a two-dimensional moustache twirler. The supporting cast fare far better – Faith Herman shines as Billy’s adorable younger foster sister – while the hero’s adoptive siblings get their own climactic moment in the spotlight that succeeds at being both thrilling and heart-warming. Aiming for the timelessness of Big, it remains to be seen if Sanberg’s second feature will be as fondly remembered in decades to come. Nevertheless, Shazam!’s candy-floss sweetness rarely fails to hit the spot.